Winter is coming! Today is definitely trying to tell us that fact in the Chicago area. I woke up today and took David to school, as I always do, and it was surprisingly warm outside. Then, about a half hour after returning home, the wind started to pick up. I sat watching the leaves whipping through the air and the tree branches bending as the wind beat them all up. As I looked at all the bare trees and bushes, and my dying mums in the front of the house, I realized that November has definitely arrived in full force. The power of the wind this time of year never ceases to amaze me. Today, as we approach afternoon, the temperatures are dropping and the warm breeze is now turning into a chilly, wet, and howling wind. In fact, the forecast is now predicting our first snow flurries this afternoon and tomorrow, and although it won’t stick, it’s still snow. When I was little snow used to excite me to no end. I would wait for the first snowfall of the year and all additional snowfalls, and I would play for hours at a time. Hot chocolate was my best friend, and I vividly remember putting my boots and gloves over the heat vents throughout the house and then tearing off my three layers of soaking wet socks. As I’ve aged, my view of snow has changed as well. I still love the first snowflakes of the season, and words lack the ability to describe the quietness and peacefulness of the first blanketing snowfall. There is something about the untouched, glistening snow over the ground that calms me and warms me. I also long for snow on Christmas Eve into Christmas Day. I love waking up to a winter wonderland as we celebrate Jesus’s birthday with our family. The day after Christmas, however, I’m done with snow for good. I don’t want to see it, I don’t want to scrape it off my car, I don’t want to shovel the driveway, I don’t want to clean it up from the floor after the dog has gone outside, and I definitely loathe driving in the stuff. Unfortunately, after Christmas is normally when our heaviest snows arrive. 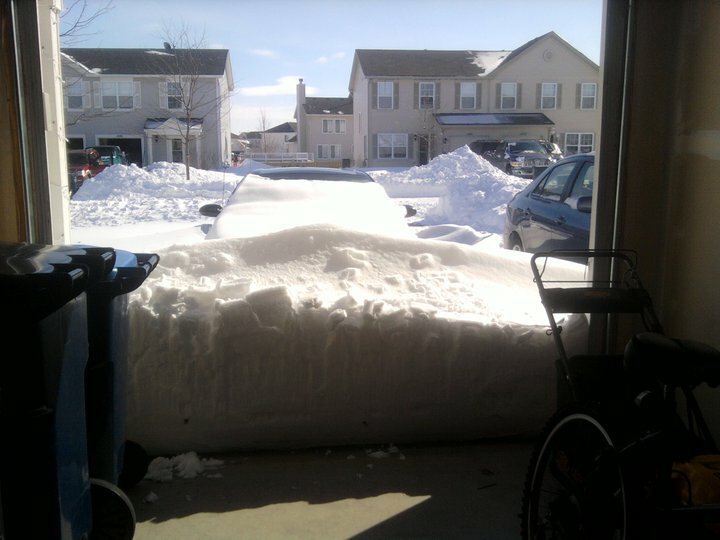 Last year, early February brought the blizzard of 2011 which left us homebound for 2 days while we dug ourselves out of the 4 foot drifts. I don’t doubt that this year we will see some heavy snows in January and February again, but when they come they are just irritating, annoying, and troublesome. Also, last year I started having a harder time breathing in the cold. I HATE the severe cold of winter. I practically lived indoors last winter, and I didn’t do much of the shoveling because of how my lungs felt. Hopefully, this year will be better, but I’m not putting any weight on that hope. David also hates the extreme cold. Because of this, we are REALLY considering getting remote start for our car (which sits outside the entire winter) as a Christmas present to each other. It’s not too bad cost wise, around $400 for parts and labor, and it would mean we wouldn’t have to wait for the car to warm up before driving off somewhere. It’s a total luxury, and we really don’t need it. But, we’re definitely considering it! With that said, it’s time to state what I’m thankful for. On this cold and blustery day, I’m thankful for heat, warm coffee, and cuddly blankets. David and I have become coffee fanatics in the past couple of years, and a warm cup always seems to do the trick for our mood. Also, I love the feeling of curling up under a snuggly blanket when the air around me is cold. I feel secure, calm, and happy under blankets. I know there are many people who suffer from cold, especially at this time of year, and I’m grateful to have heat, warm drinks, and blankets to keep me nice and toasty warm. I hope you all stay nice and warm on this chilly November day, and I hope you are able to find something to be thankful for today.